Emporio Armani shows off its ability to style with grace and minimalism with this beautiful watch featuring a stone-set mother of pearl dial and a slim blue strap. 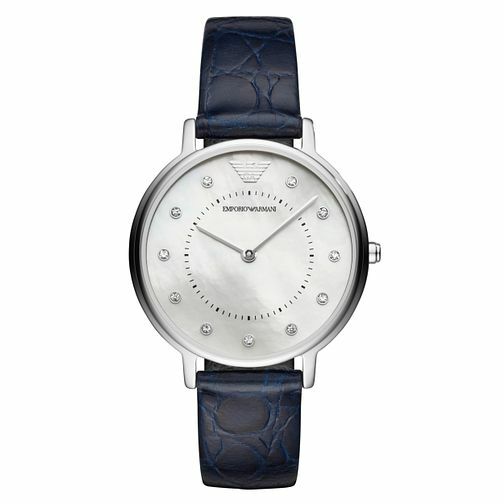 Emporio Armani Ladies' Mother of Pearl Blue Strap Watch is rated 5.0 out of 5 by 1. Rated 5 out of 5 by Anonymous from Beautiful and classy watch As the watch was not available in my nearest Earnest Jones shop I decided to purchase online. This was easy and the watch was delivered in good time. However, the package was left on my back doorstep in the rain and this was supposed to be a secure delivery!! Purchased as a 50th birthday gift and the quality of the watch was lovely and well received by the recipient. Unfortunately the box came a bit scuffed and I was disappointed as this was a special gift! I went into the nearest Earnest Jones shop and they were only too happy to exchange the box to match the quality of the watch. At this point I was very happy!